Most of us sometimes think that doing the laundry takes too much time. It’s a rather time-consuming process to wash different colours and fabrics separately in one load after another. Luckily, Samsung has addressed this issue with its new 2-in-1 Samsung FlexWash washing machine and FlexDry dryer duo. Combining these two appliances yields a powerful laundry system for large families that can wash and dry multiple loads at the same time at different settings. How to design a 2-in-1 washing machine? One obviously needs to utilise both the front and the top as entry points for loading in order to achieve two washers in one machine. As a result, Samsung utilises the front as front-loader and the top as top-loader. The compartment at the top is smaller with a capacity of 1 square foot and therefore suitable for washing clothes that require special care. The main load goes in the larger, 5 square feet front compartment. The SuperSpeed feature reduces the washing time by up til 50%. The FlexDry dryer employs a similar set-up as FlexWash’s. The top part consists of a flat rack called Delicate Rack for drying clothes that require lower temperatures and more care as it doesn’t tumble and instead relies on heated airflow. The Samsung Smart Home app enables users to control FlexWash and FlexDry remotely. It’s possible to start and stop the machines as well as monitoring progress. 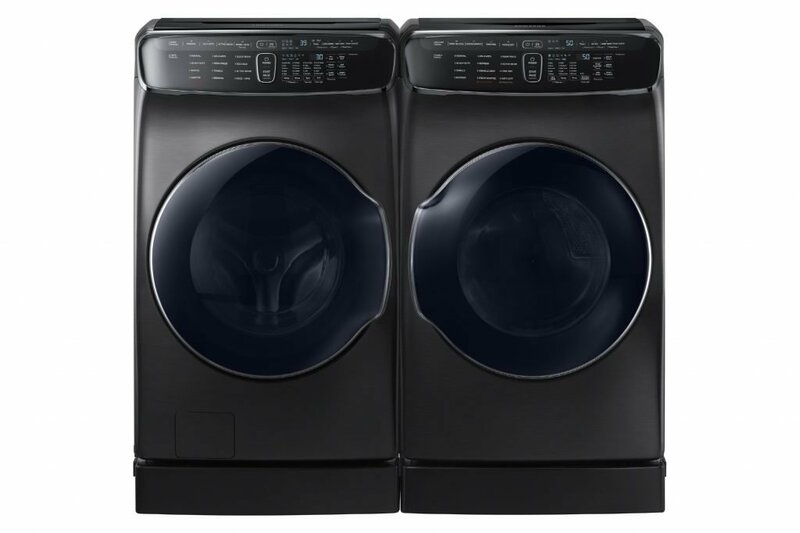 Samsung hasn’t communicated a price yet for the washer/dryer duo. Expect to pay several thousand dollars for the pair. My guess is that many Kiwi households perceive FlexWash and FlexDry as offering high-value despite the high price tag. The release date is still unknown. We’ll update this article with more information shortly.